WOW ! There are no better words than that !! Beautiful !! Oh looks so sweet and peaceful! Whoops! My son must have been logged in under another name - I was trying to say...absolutely wonderful! OH MY HAPPY HAPPY COLOR!!! Geezy Weezy! You amaze me!!! 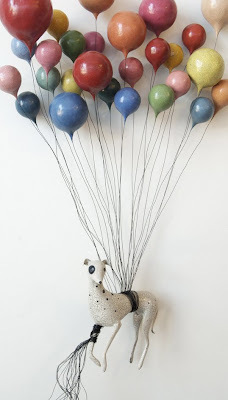 I love this little box, s balloons, the dog ...... gorgeous. Beautiful character you've created. Love it all!